Google I/O, otherwise known as Android Christmas, is about a month and a half away, but it's never too early to start getting excited about it. Even if you didn't get the opportunity to purchase a ticket or you did but can't go, the sessions are streamed live and then published on YouTube so everyone can watch them and catch up on all the new things in Android. 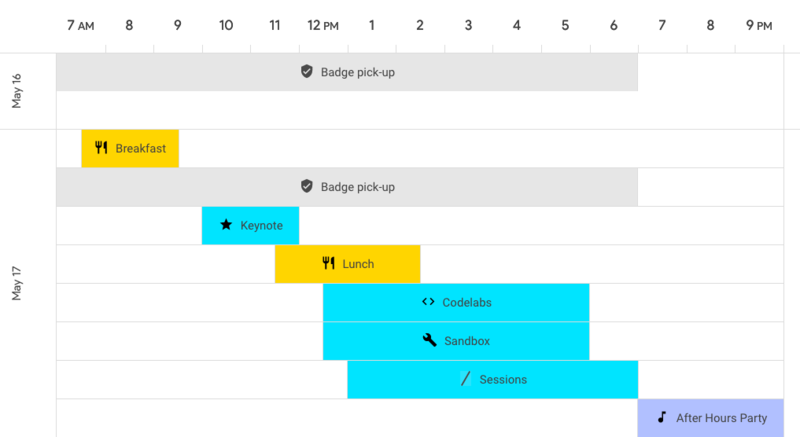 The Google I/O website was updated yesterday to add the first wave of Google I/O sessions, so you can start planning your schedule whether you're attending live or watching at home. The main keynote is the first day, May 17, at 10am PT, and it's followed by many sessions including "What's new in Android." The second day's sessions focus on more specifics like the new things in Google Play, Android Security, and Android Design Tools. There's also an "Android Fireside Chat" at 6:30pm where engineers and other Android team members will be on stage to answer attendees' questions. The third day has interesting sessions like exploring the new features of Android O notifications and Android sensors and location. If you'll be attending live, you also have an after-hours party the first day and a concert the second day to look forward to. Look out for Artem there, he'll be the one carrying his phone and/or computer and checking tips emails, shouting at us in Slack, and adding every single new thing to talk about in a Basecamp task for us to take care of. Yeah, your Android Christmas is our Android Week Of Hell.